Fast, dramatic changes in the digital space have given brand marketers new opportunities to earn and sustain the consumer’s attention without paid media. Social platforms such as Facebook, Twitter, and Pinterest, to name just three, empower brands to communicate directly with an audience. While many brands rush to leverage these direct to consumer channels, few have altered their brand narratives and their approach to content creation as they move from paying others to broadcast their brand content to leveraging it themselves for direct consumer engagement. Despite the existing opportunities, it would seem that few brands — and only a few more of their agencies — have the content, process, and methodologies in place to fully benefit from direct distribution to the audience. The current brand-agency paradigm has been effective in leveraging search and social algorithms for more efficient distribution of “brand” assets, but the efforts stemming from this approach have failed to deliver some critical elements: engagement, efficiency, and scale. Brands looking to achieve this “holy trinity” of digital effectiveness need to shift their content creation approach even further. Strategist Jim Cuene recently proposed a state of constant content to help marketers behave as publishers. 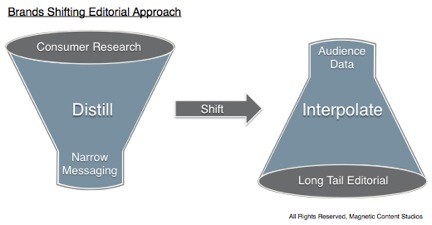 And the Altimeter Group’s Content: The New Marketing Equation does a great job of illustrating a “path” for brands to follow in rebalancing their marketing efforts, shifting “from push to pull.” In fact, Cuene and Altimeter both reference the need for this shift in their content creation. But what characterizes this shift, and how can CMOs get started when looking to alter the manner in which their organizations influence consumers? The shift they both reference is to a state of “owned media” — not the narrow, “brand-controlled” definition that seems to be pervasive across many media strategy blogs. Rather, it’s to a state of “media ownership” — a more progressive definition of owned media. By simply flipping the words and adjusting the grammar, we add clarity around the model. Jim Cuene is right. Brands need look no further than many online publishing properties for a model on how to create content using an operational discipline that ultimately leads to better results. 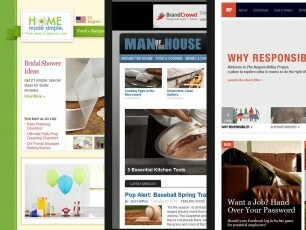 Always-on: Are you publishing content for an audience on a daily basis? Editorial: Are you publishing content that an audience needs and shares? Independent: Do you own the technology or the platform delivering the content? Do you have the final say in all aspects of the user’s experience? Networked: Is the content on your platform optimized for distribution? Measured: Are you evaluating how efficiently you are producing media, or the consumption of your content? Monetizable: Could your content platform be someone else’s paid media? If you answered yes to all of the questions above, then congratulations, your content marketing initiative is optimized for better business-building results. If you answered no, then the next step is to assess where your organization is in its journey to operating as a publisher. This assessment of owned media is important because it instills a level of accountability with content creation. Online publishers operate by exacting principles because they need their audiences to consume, engage, and share the content they produce. Operationally, these publishers need to ensure that their editorial efforts are efficient and yielding high-quality content that resonates with their most important critics — the audience. Their very businesses depend on it. Brands want their audience to consume, engage, and share content, as well. By applying the same business acumen in planning and evaluating your audience engagement as any publisher would, brands can effectively achieve the three goals of engagement, efficiency, and scale. Not employing this methodology, in my opinion, is the single biggest reason brands are finding underwhelming results in their current search and social efforts. With some brands, asset creation evolves into a content strategy, wherein incremental success can be achieved by delivering the same old brand narrative but doing so with a slightly broader focus on types of content, and through innovative channels such as Facebook and Twitter. But the issues of reach and engagement are not addressed by this approach. I’ve had brands with significant search and social programs in place confess to me “We’re not getting enough traffic to the website,” and “We have 1 million Facebook fans, but very little engagement.” And, these brands are sustaining the same paid media spend to maintain the necessary share of voice in their respective categories. This is not the kind of efficiency brands are looking for when executing content marketing strategies. The good news for brand marketers is that their preliminary efforts in content marketing put them squarely on the path to owned media. It’s within these initial phases of content marketing that brands soon discover how important some level of editorial process is in generating quality content at a faster rate, and at higher volumes. By editorial, I mean the constant process of determining what the audience needs. It’s also at this stage where brands discover how important the investment in a centralized platform is in helping them manage to and optimize content marketing across multiple digital channels such as Facebook and Twitter. There are several successful, brand-owned media programs that can help guide other brands. Home Made Simple, Nutrition Possible, and The Responsibility Project are all examples of how brands can take an editorial approach to engage the entire audience — not just limited segments of it, which is where most brand marketers seem to focus. This audience-centric approach is paying dividends for these respective brands while amplifying their earned and paid efforts, as well. This shift to true “always-on” editorial is the biggest challenge most brands will face on the path, but it is critical to creating quality content that audiences prefer, and realizing the full potential of owned media. So how do marketers go from content that represents their messages to consumers to content that audiences themselves are looking for? It first requires thinking beyond the brand’s target segments and focusing on understanding the needs of the entire audience in much greater detail. This can be particularly challenging, as marketing operations are almost exclusively geared toward distilling layers of consumer research into one-size-fits-all insights and, consequently, focused messaging. And for good reason — brands don’t have the resources to talk to the entire audience through traditional paid means. But they can accomplish this through the right owned media strategy. For most brand marketers, becoming more informed editorially simply requires organizing all of the available data around audience behavior to define and understand consumer’s content needs. For example, Man of the House publishes dozens of articles that present unique perspectives on personal grooming — from the best grooming gifts for dad to rationales for getting a manicure. This content might fall outside the focus of brands like Gillette or Art of Shaving, but Man of the House content is informed by extensive consumer research. And by interpolating this existing audience data, Procter & Gamble knows its articles are falling in line with what interests the site’s primary audience (dads), which is likely much larger than the consumer segments Gillette advertises to. Once this audience editorial analysis is complete, it will continue to guide your brand’s editorial strategy development and help you determine the right level of owned media investment. Having worked with a multitude of consumer packaged goods (CPG) marketers, I’ve always been somewhat amazed with the sheer depth of consumer knowledge each organization possesses — and equally amazed at how little of this knowledge actually factors into its content creation. When brands take a deeper look at their broader audience, there is always a more detailed set of topical categories to map, and brands should follow this map in creating the content they deliver to this broader audience. The appropriate level of data analysis can help brands chart this map. Beyond existing consumer data, analytics should be used to inform the editorial on an ongoing basis. The resources required to develop and sustain an owned media strategy can usually come from the brand’s existing investment in analytics. But even free resources, such as Google or Compete, can provide a wealth of information — especially if they are used in conjunction with more robust paid tools. Google Analytics data is being used to identify the most popular articles, which are then served up at the top of the page to drive further content consumption. Google Adwords is being used to track topic popularity by reviewing search query volume across a host of long-tail keyword phrases related to grooming. Lastly, it’s critical that publishers keep track of the competitive space for topics. This article in particular is a great example of observing what is being talked about and joining in the discussion. 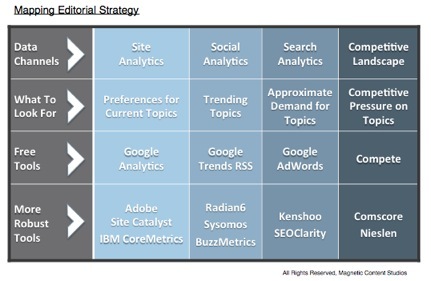 This editorial map is the foundation of an iterative process that’s always on, and optimized for producing content that gets consumed, creates engagement, and gets distributed. To be clear, the editorial shift required to create owned media impact is not an “or” that could replace another approach. It’s an “and” that supports a brand’s broader marketing strategy. Advertising and other paid media still work, but technology has now made direct distribution to an audience an affordable strategy (with the proper approach). Regardless of where a brand might be in its use of owned media, it should consider developing an editorial voice that guides sustained content creation to address the needs of its audience that aren’t being met through that brand’s other marketing efforts.